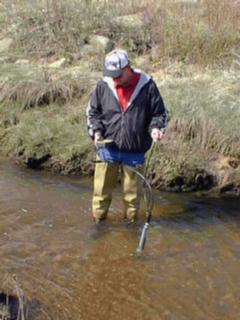 Water quality parameters provide important information about the health of a water body. These parameters are used to find out if the quality of water is good enough for drinking water, recreation, irrigation, and aquatic life. But what do the parameters really mean? How are they measured? What natural and man-made factors affect them? This page provides a brief summary of what each water quality parameter means, and also links to more extensive information. Alkalinity refers to how well a water body can neutralize acids. Alkalinity measures the amount of alkaline compounds in water, such as carbonates (CO 3 2- ), bicarbonates (HCO 3 - ), and hydroxides (OH - ). These compounds are natural buffers that can remove excess hydrogen ions that have been added from sources such as acid rain or acid mine drainage. Alkalinity mitigates or relieves metals toxicity by using available HCO 3 - and CO 3 2- to take metals out of solution, thus making it unavailable to fish. Alkalinity is affected by the geology of the watershed; watersheds containing limestone will have a higher alkalinity than watersheds where granite is predominant.